have now become synonymous. 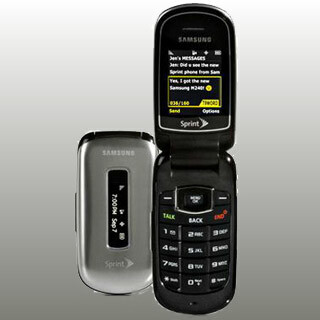 Recently Sprint unveiled one such clamshell handset from Samsung, known as the M240. The low end mobile phone packages internal as well as external display. The dimensions of the device are 1.85″ x 3.6″ x 0.74″ and it weighs around 3.0 oz. The metallic silver colored handset's large keys simplify texting. The M240 is equipped with a 960 mAh Li-Ion battery that offers 6.5 hours of continuous talktime. Further, users can opt either for English or Spanish for all voice and text menu prompts. Users can now access websites instantly and easily via the Sprint handset. Sadly, the Samsung handset does not incorporate a camera. The mobile phone is inclusive of Sprint's wireless backup service that restores contact information incase the handset is lost, stolen, damaged or replaced. The M240 features an embedded Global Positioning System and carries a HAC rating of M4 for hearing aids, operating in the acoustic mode. Further, the clamshell is attuned with few TTY devices. With speaker-independent voice dialing capability, users just need to call out the name of a contact present in the phonebook and the number is dialed automatically without using the keypad. The Samsung M240 is retailed for a reasonable price of $19.99 with two years of contract. Why Mother is special !! !